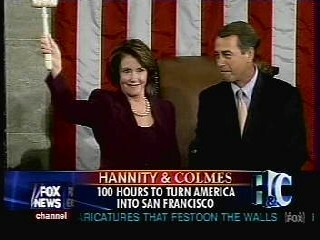 Sean Hannity was full of predictably peevish partisanship last night (1/4/07) on Hannity & Colmes as he made the ludicrous claim that the Democratic agenda of raising the minimum wage and combating global warming “because they have spent way too much time watching Al Gore’s new DVD” was out of step with America. But two FOX News banners were unusually biased, even by FOX News standards. 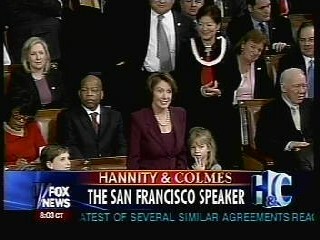 I have a feeling "San Francisco Speaker" is going to be with us for a long time.